In the heart of Burgundy wine country, Beaune is a charming small town with some exceptional sights! Beaune is a compact small town in the heart of Burgundy (map) whose shape reflects the old city walls, about half of which are still in place today. Beaune is just 312 kilometers (194 miles) southeast of Paris, easily reached by train. It's also just 46 kilometers (29 miles) south of Dijon, about 20 minutes by train or 40 minutes by car; and 156 kiometers (97 miles) north of Lyon, or about an hour and a half. There are a few excellent hotels within the city walls and more on the outskirts of town. A variety of restaurants offer traditional Burgundian fare, and there are also several Michelin one-star restaurants. Beaune is an easy town to explore on foot, since most of what you want to see is within the walls. Place Carnot with its many restaurants and the pedestrian Rue Carnot are the main pedestrian areas, and all of the major sights are within a few minutes walk. A ring road surrounds the center, and you can also walk along the ramparts. 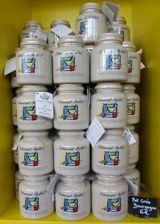 Jars of Mustard at Fallot. 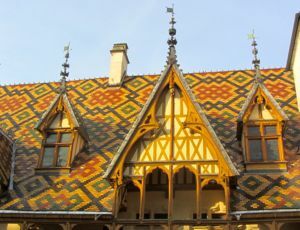 Beaune is best known for the Hôtel-Dieu, a charity hospital built in 1443; its beautiful tiled roof is a symbol of the region. You might also want to visit the Musée du Vin, or Wine Museum; Fine Arts Museum; weekly market; and Basilica Notre-Dame. You can also tour the Fallot Mustard Works and learn about this important product. Beaune is an excellent place to use as a base for visiting the wine regions of the Côte d'Or and taking excursions. 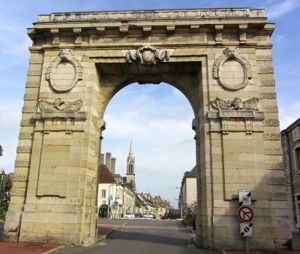 With places such as Nuits St-Georges, Clos de Vougeot, and Gevrey-Chambertin just a short drive to the north, and Mâcon and Cluny to the south, Beaune is well situated for excursions. Below, Porte St-Nicolas, on the northern edge of Beaune.